Have you dusted off your elementary school themes idea ? If you're an elementary school teacher, the school buses are rolling and school bells are ringing. The laughter of students is being heard on playgrounds all around the country. The first few weeks of - back to school - planning focuses on student achievements and classroom organization. Let's consider some of the resources you'll need for the best classroom and to help with "getting to know you" activities. Afterall, you know it's best to keep your elementary students engaged in desired activities. This is a simple classroom management requirement... BUT we all know it's not always that simple to do. Each of us has our own "tricks" we like to use. Some tricks we've developed ourselves and some we may have picked up from other grade school teachers. Hand signals, clapping and snapping, audio count down timers, or even the visual traffic light display are part of our "bag of tricks." And... we've found many creative ways to use them. Many teachers like to use school themes in their instructional units. Our themes can be adapted to any K-12 grade level but we'll concentrate on elementary school themes for this discussion. 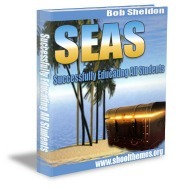 Themes focus on a single topic of interest to students. We and most others... name our themes with acronyms. A few examples... TWIST (Teamwork Will Inspire Students and Teachers... SEAS - Successfully Educating All Students... HAPPY - Have A Positive, Productive Year). And here's a link to our acronym tutorial just in case you're working on school theme ideas of your own. A focused theme provides a core for group activities as you build on the natural interests of learners. Although all themes have specific names... that "influence your approach", it's the writing, speaking, listening, reading, calculating, and core content that become the real value or benefit. Elementary School Themes can maintain student interest for a long period of time and provide continuity between activities by combining all related concepts under one umbrella. Elementary school themes can be effective student motivators. But a little caution may be worthwhile. WOW your school spirit can really soar ! So.. you want to be sure your theme selection has purpose and relevance. Choose a popular topic that addresses your school's culture or.. pick an area that has "interdisciplinary" potential. Or maybe a current issue about... the environment, sports, travel, military, health or history are possible. Some schools have a single elementary school theme that lasts a whole year. Others use several themes and different grade levels compete among themselves for the "best" approach. Other options include choosing popular videos, websites, TV shows or current events. Whatever your choice... it becomes a shared experience and a focal point for the unit. Regardless of background, prior learning, reading level or math skills, all of the students can share in the theme through a single experience. And speaking of skills, lets remember we can't forget to focus on academics and the role items such as printable math worksheets have in assisting both teachers and students. Themes can serve as the communal focus area or centerpiece for the entire unit. Consider adding ideas that keep your elementary school theme fresh and exciting. The length of the unit will depend on the number of outcomes as well as the number of activities you identify. Having difficulty picking a theme ? Try this exercise... and remember the help you'll expect from your theme team... begin writing a list of topics a particular grade level is interested in. Then identify current popular TV shows, movies, and fads? Next see if you can identify any overlap between the student grade level interests and the standard cirriculum content for that grade. Now try to connect the content with interests and develop a theme you could use in writing, science, math or geography units. Remember - you want your chosen elementary school theme to be meaningful ! Your theme can stimulate relationships, meanings and emotions that raise teacher and students to higher levels of thinking, feeling and understanding. Our goal is to share best practices, resources, inspirations and strategies for serving students... and we have prepared some elementary school theme ideas to help you invest in their future. 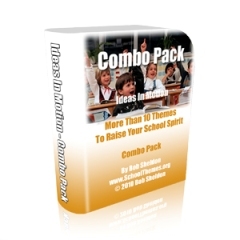 Leave Elementary School Themes and Select Your School Theme!